Some co's already benefiting e.g Microsoft's data centre saved >USD140k p.a, progress also from AB InBev et al. This paper was first published on the Trucost website on 22 March 2018. Click here to see the original publication. Water is essential to the production and delivery of nearly all goods and services. Pollution and overconsumption of water are making clean water an increasingly scarce resource, putting business and economic growth at risk. Companies can manage these risks by accounting for water-related impacts, understanding the financial implications of water scarcity, and integrating water management into decision-making. Economic development, population growth, and climate change are putting increasing pressure on water resources and water quality, creating risks for all sectors. For example, about 40% of power plants in India are in areas of high water stress, and 14 of the country’s 20 largest power plants experienced at least one shutdown due to water shortages between 2013 and 2016. The World Economic Forum’s Global Risks Report said that microscopic particles of plastic waste were found in 83% of tap water supplies, and people eating seafood could be ingesting up to 11,000 pieces of microplastic each year. The price of water does not reflect its true cost. In many regions of the world, even where fresh water is scarce, water is underpriced and does not reflect the social and environmental costs of water pollution and scarcity (see Exhibit 1). A Trucost study found that if the full cost of water availability and water-quality impairment had to be absorbed by companies, average profits would be cut by 18% for the chemicals industry, 44% for the utilities sector, and 116% for food and beverage companies. Investors and companies recognise these increasing risks. The number of institutional investors committed to engaging with companies on water-related risks grew to 639 in 2017 from 150 in 2010. These investors together represent USD69 trillion in assets. More than 500 companies have board-level oversight of water issues, and they invested USD23 billion in water conservation projects in 2017. Unlike carbon emissions, water-related impacts are highly location specific. A cubic meter of water used in a drought-prone, highly populated area will have a greater environmental impact than a sparsely populated area where water is plentiful. In assessing water availability or pollution, the whole catchment or river basin needs to be considered, rather than one river in isolation. Multinational companies may need to consider the varying regulatory costs, environmental benefits, and social considerations of different catchments in the countries where they operate. This means that it may be necessary for businesses to develop water management plans that include context-based targets and improvement measures based on a robust understanding of the regions in which they operate and source supplies. Some companies may think that they are not at risk from water-related impacts because they do not use large amounts of water in their own operations. However, companies are indirectly at risk through purchases of water-intensive raw materials, such as agricultural commodities, or energy from fossil fuel power plants that need large amounts of water for cooling. Droughts can lead to raw material shortages and increased costs. Companies need to identify and engage with water-intensive suppliers in order to understand what steps they are taking to manage these risks and work with the suppliers to introduce water conservation measures. For climate change, there is scientific and political consensus around the Paris Agreement goal to limit global warming to less than 2 degrees Celsius. Although no such quantified international agreement exists for water, the Sustainable Development Goals (SDGs) aim to “ensure access to water and sanitation for all” by improving water quality and sustainable water resource use by 2030. Many companies and investors are considering how they can align their corporate sustainability programs to contribute to achieving the SDGs. Companies can understand, as a first step, how water is material to the overall business strategy. Water use can be quantified across operations, whether the water is withdrawn from groundwater, municipal supplies, or other sources, as well as the amount of water recycled and reused. Effluent discharges and the water quality of receiving waters can also be monitored—indeed, many companies will be required by law to gather this data and report it to regulators. This information will help companies prioritise actions and set targets to reduce water use or to improve quality of discharge water, thus reducing water risk and cost. Need to cover direct & indirect costs – regs, reputation etc. In addition to the direct costs that companies pay to purchase and treat water, there are also indirect costs, such as the energy cost involved in pumping or heating water. Reputational risks associated with a company’s water use or discharges and regulatory risks associated with decreased water allocations or more stringent permits are also important to understand. Because water is a shared resource, companies also need to understand the environmental and social costs of water use in the communities where they operate or source their raw materials. Valuing these natural and social capital impacts provides companies with a way to quantify risk and their triple bottom line performance. In a world where clean water is increasingly scarce, insights into future water availability, water treatment costs, and water quality are essential to managing business risks. Companies may want to develop possible future scenarios of water risk, considering various economic, social, and environmental factors, such as growth plans, demands from other users, and likelihood of water stress in the local region. Adopting water reduction targets that are based on scientific data and the local context will help ensure future business profitability and growth. There are a number of tools that are widely recognised as best practice for companies looking to manage water risks. The Sustainability Accounting Standards Board (SASB) is a sustainability reporting framework aimed at disclosing information to investors that could affect the financial performance of a company, such as water and wastewater management. The SASB provides disclosure standards for 79 industries in 11 sectors. The CEO Water Mandate mobilises business leaders internationally on water and sanitation challenges for achieving the SDGs. Companies that endorse the mandate must commit to implementing water stewardship best practice and reporting annually on their progress. The Water Risk Monetizer is a publically available global water risk tool that calculates the financial cost of water risks. It provides a series of metrics, including revenue at risk, increased operating costs, and water “shadow prices,” that can be used to assess return on investments and make the business case for water conservation (see Exhibit 2). By accounting for the true cost of water and how it may increase in the future, companies can make the business case for action to minimise water risks and reduce costs. 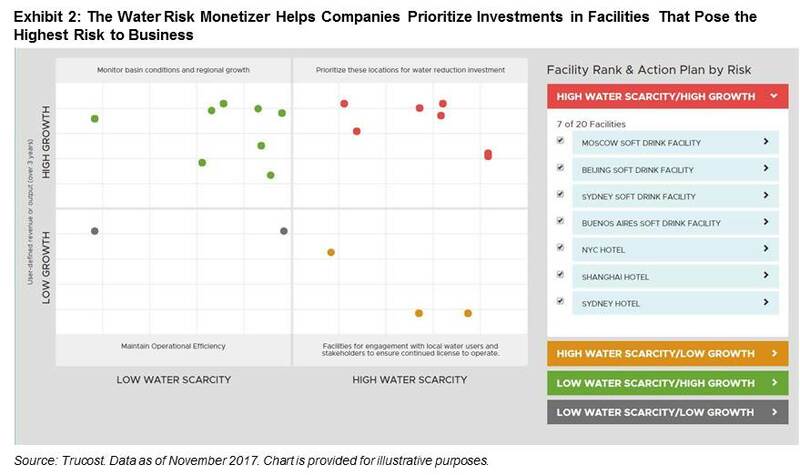 For example, Microsoft is using the Water Risk Monetizer to prioritise sites for water management projects, such as data centres, which use large quantities of water in their cooling systems. A Microsoft U.S. data centre near San Antonio, Texas, is located in a high water-stress region. The Water Risk Monetizer revealed that the site’s risk-adjusted water bill, which represented the true value of water to Microsoft, is more than 11 times greater than the site’s current water bill. Microsoft worked with Nalco Water, an Ecolab company, to develop a strategy to use recycled water at the site. This has resulted in savings of more than USD140,000 in water costs per year, while also avoiding the use of almost 60 million gallons of potable water per year. Companies increasingly recognise that water scarcity and quality issues could limit business growth, unless the company works to protect and enhance natural resources. For example, Anheuser-Busch InBev says, “As a brewer, water is critical for us. Without water, there is no beer. Working in partnership with others, we have the opportunity to use our scale and expertise to work towards ensuring a reliable, clean supply of water is available for not just ourselves, but also for local communities and the environment.” The company’s focus on onsite water efficiency and risk management, watershed protection for operations and brewing materials, water access programs, and employee engagement reduced its water consumption to 3.14 hectoliters per hectoliter of production in 2016, compared with 3.54 hectoliters in 2012. Companies operating in water-scarce areas could be at risk of reputational damage through conflict with local people over water resources. Implementing a water stewardship program to help protect water resources in the catchment can help reduce these risks and demonstrate the company’s commitment to being a responsible business. For example, The Coca-Cola Company has a comprehensive water stewardship program focused on improving water-use efficiency and reuse, managing wastewater and stormwater discharge, mitigating water risk, replenishing the water it uses in its beverages, and helping manage water resources in its agricultural supply chain. In 2016, Coca-Cola replenished 221 billion litres of water per year, continuing to meet its goal to replenish 100% of the water used in its beverages back to communities and nature. Water is an essential but undervalued resource for many business sectors. 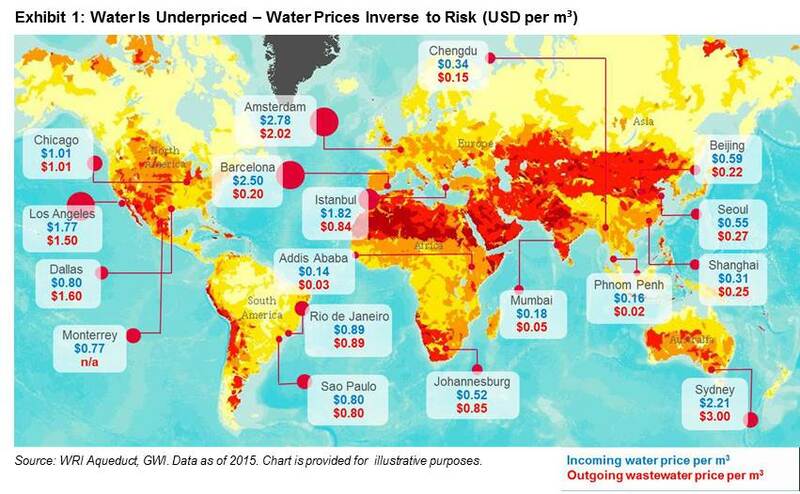 Increasing water scarcity and pollution is exposing companies and market participants to significant financial risk. These challenges can be overcome if companies take advantage of available tools to account for water in operations and supply chains, and integrate the true value of water into decision making. 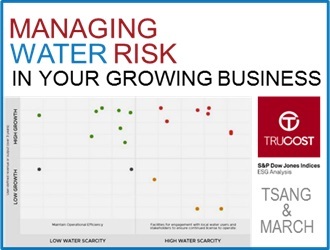 At A Glance: Water Risk Dashboard – Need to gauge water risks across your operations, suppliers or investees at a glance? China Water Risk’s Hubert Thieriot expands on a new dashboard for exactly that – check it out! Rochelle is a Senior Analyst in the Corporate Services team at Trucost, part of S&P Dow Jones Indices. Rochelle joined Trucost in 2017 and brings several years of experience providing critical advice for improved outcomes across a diversity of sectors, including healthcare, food and beverage, tourism, technology, finance and nonprofit. She specializes in natural capital valuation, business model innovation and developing quantitative and qualitative impact methodologies. Prior to Trucost, Rochelle was a Manager of Project Innovation & Design at strategy consulting firm, SustainAbility, where she developed custom methodologies for measuring corporate impact against the Sustainable Development Goals, and managed a broad range of consulting projects for clients such as GE, World Wildlife Fund, Nestle, TIAA, Huawei and others. She graduated from Bard College in 2015 with an MBA and MS in Environmental Policy and holds a BA from New York University in Individualized Study: Landscape Architecture. She is also a LEED AP in Building Design and Construction and is GRI certified. Byford is a Senior Analyst at Trucost, part of S&P Dow Jones Indices (S&P DJI). Byford specializes in supply chain environmental footprinting, life cycle analysis and corporate sustainability strategy, helping clients achieve best practice in ESG impact and risk disclosure. He has led supply chain footprinting and product life cycle analyses in hospitality, textile and apparel and electronic sectors for corporate clients in Europe, Asia and North America. Prior to joining Trucost, Byford was an Analyst at the Children's Investment Fund Foundation where he managed a portfolio of philanthropic grants in China and Brazil, with a focus on climate change, sustainable urbanisation, air quality and forest restoration. Byford holds a MSc Environment and Development from the London School of Economics and BSSc (Hons) in Geography and Resource Management from the Chinese University of Hong Kong. Byford in fluent in Cantonese, Mandarin and English.